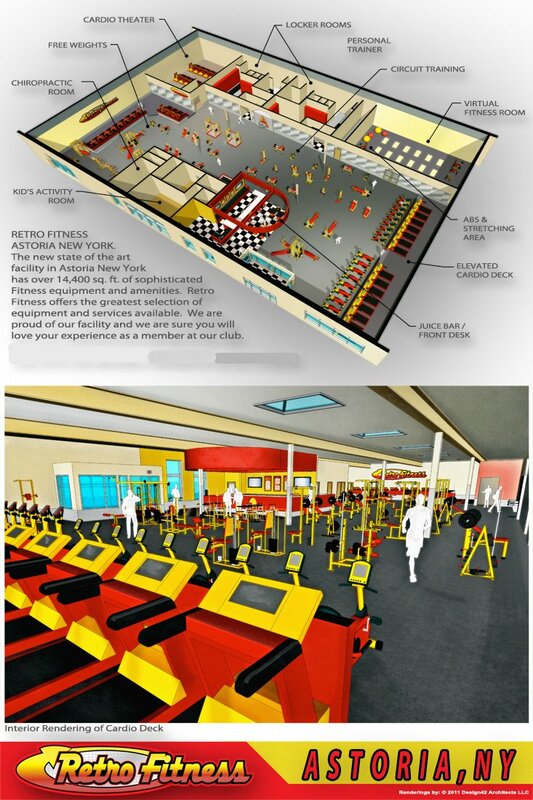 Retro Fitness is a new fitness center built within an existing warehouse space in Astoria, Queens. 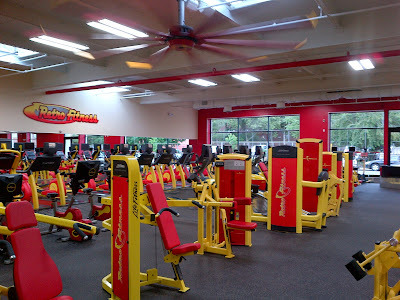 As a franchise the project required coordination with both the local client and corporate representatives to ensure the project both addressed the needs of local clientele while fitting in with the Retro Fitness model. The result is a 30,000 square foot space that incorporates a large open gym floor featuring a variety of targeted workout areas for cardio, weight training, and boxing. Supplementary and support spaces surround the large open gym floor. These include a theater which features current movies customers can enjoy while working out; a daycare facility, where members children can play; a full service juice bar; changing rooms; office; and a new state-of-the-art "Retro On-Demand" room. Retro On-Demand allows members to access a digital trainer who will personalize a workout based on the members wants and abilities. In order to create a welcoming presence on the street, which is shared with some light industrial spaces, a union hall, and a Best Buy, the space was given a new front facade. Continuous exterior insulation and a synthetic stucco finish was installed along with large expanses of insulated storefront that update the gyms appearance while activating the street with energy from within the gym. While a tight construction schedule and budget drove many of the decisions during the design process increased energy efficiency was set as a goal from the start. In order to meet these goals a continuous layer of insulation was added to all exterior walls. This not only minimized thermal bridging through the concrete block walls but also added sound insulation between the gym and the neighboring residential neighborhood, a city requirement. Additionally, existing skylights were restored and bring in ample daylight into the space. This along with new, energy efficient, lighting throughout helps to lower energy demand within the space while creating a pleasant atmosphere for working out.